Dr. Léopold Demiddeleer got his PhD in Physical Chemistry at the Brussels University in 1976. Having started his career in 1976 by teaching physics and mathematics, he joined SOLVAY S.A. in 1981. He took over various R&D and Innovation management positions. Starting in catalyst research, he successively led different global R&D and Tech Services entities of the Group such as high-performance materials and polyolefins. Founder in 2014 of TechBridgeOne S.P.R.L., a consulting company aiming at bridging start-up’s, venture funds and industrial partners. 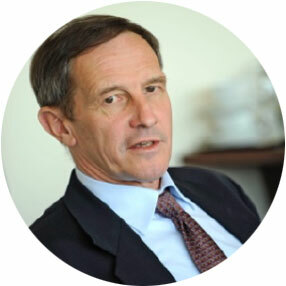 He is currently member of the Board of McPhy Energy (EURONEXT listed start-up), President Emeritus of the Board of the European Industrial Research Management Association (EIRMA), President of the Board of ENOBRAQ (White Bio Tech – Toulouse) and Managing Director for Development in Europe for the Georgia Institute of Technology (“Georgia Tech” – Atlanta – USA). He is a Member of the Belgian Royal Academy for the “Technology & Society” Class.